The Best Cambridge Blogs from thousands of Cambridge blogs on the web using search and social metrics. Subscribe to these websites because they are actively working to educate, inspire, and empower their readers with frequent updates and high-quality information. 2.30 The Cambridge Wine Blogger | A blog. About wine. Mostly. Cambridge newsletter is a comprehensive summary of the day's most important blog posts and news articles from the best Cambridge websites on the web, and delivered to your email inbox each morning. To subscribe, simply provide us with your email address. Cambridge, UK About Blog The Cambridge News is a daily newspaper covering Cambridge and the wider Cambridgeshire area. It was founded by William Farrow Taylor as the Cambridge Daily News in 1888. It includes breaking news updates, sport, football, local events and business. Facebook fans 69,657. Twitter followers 83,214. Cambridge, England About Blog The mission of the University of Cambridge is to contribute to society through the pursuit of education, learning and research at the highest international levels of excellence. It is one of the world’s leading research universities, and offers a wealth of study opportunities for individuals from around the world. Follow us to keep up with News and events from the University of Cambridge. Facebook fans 2,101,905. Twitter followers 424,313. Cambridge, UK About Blog Cambridge University Press has been publishing dictionaries for learners of English since 1995. Follow us to keep up with articles on Grammar, Spanish English, American English, British English and many more. Facebook fans 2,342,207. Twitter followers 167,893. Cambridge, England About Blog Tiger Mint is a Cambridge lifestyle blog published by Debs a lifestyle blogger, writing all about food, fashion, wellness, mental health, and travel. Get inspired by trips and Travel. Learn what can make you happy. Facebook fans 11. Twitter followers 107. Cambridge About Blog I began blogging about the Duchess of Cambridge after watching the Royal wedding on 29th April 2011. Kate has captured the interest of the media, fashion elite and millions of people all over the world. Follow us to keep up with articles on fashion and Lifestyle of Dutchess Kate. Facebook fans 20,757. Twitter followers 66,707. Cambridge, England About Blog The Cambridge Independent is a news website published by Iliffe Media Ltd. Their aim is to offer a high quality, trustworthy, useful and entertaining service to the community of Cambridge and its surrounding region. Facebook fans 1,529. Twitter followers 3,195. San Francisco, CA About Blog Follow us to keep up with articles on Cambridge from Reddit . Facebook fans 1,208,287. Twitter followers 574,163. Cambridge, UK About Blog Cambridge Fans United is the official supporters trust and fans forum for Cambridge United Football Club. Their aim is to ensure that CUFC is operated in a financially prudent manner with the fans represented at all levels. Facebook fans 2,381. Twitter followers 3,057. London About Blog Follow us to keep up with latest news, world news, sports, business, opinion, analysis and reviews on Cambridge from the Guardian, the world's leading liberal voice. Facebook fans 8,027,060. Twitter followers 7,311,267. Cambridge, UK About Blog Business Weekly is a worldwide window to Cambridge Business, Innovation and Technology. Follow us to keep up with articles from Business Weekly. Facebook fans n/a. Twitter followers 9,755. Cambridge, England About Blog Cambridge University Press is part of the University of Cambridge. They enable people to achieve success by providing the best learning and research solutions. They support their customers through continually improved content. Follow us to keep up with News, events and updates from Cambridge University Press. Facebook fans 123,380. Twitter followers 12,166. Cambridge About Blog Welcome to Cambridge Food Tour. They are the local experts in creating unique food tours and events. They design their food experiences around your requirements and favourite food and drink. Facebook fans 1,958. Twitter followers 4,082. Cambridge, England About Blog Faculty of University in Cambridge of History includes Information about undergraduate, masters and PhD courses. It is one of the largest history departments in the world. By the output of scholarship, for instance. Subscribe us to keep up with News and events from the History Faculty, University of Cambridge. Facebook fans 1,136. Twitter followers 3,418. Cambridge About Blog Award Property Management team is led by Andrew Ward who has over 16 years’ experience. They offer residential lettings and property management services throughout Cambridge and the surrounding towns and villages. Facebook fans 183. Twitter followers 738. Cambridge, UK About Blog Cambridge University Library is committed to playing its part in maintaining this reputation both now and in the future. The Library enables and enhances research, teaching and learning through its expertise, collections, facilities and services. Follow us to keep up with Library news and events from Cambridge University Library. Facebook fans 9,998. Twitter followers 14,680. Cambridge About Blog The Cambridge Institute for Sustainability Leadership (CISL) work collaboratively with their peers not only to develop solutions but also to shared challenges and catalyse real systems change. Their mission is to empower individuals and organisations to take leadership to tackle critical global challenges. Facebook fans n/a. Twitter followers 10,341. Cambridge, UK About Blog The Department of Psychiatry promotes the mission of the University of Cambridge to contribute to society through the pursuit of education, learning, and research at the highest international levels of excellence. Their particular focus is on the determinants of mental health conditions, their treatments and the promotion of mental health through innovative translational research. Facebook fans n/a. Twitter followers 10,552. Cambridge, England About Blog Cambridge Mask Co. was founded by Christopher Dobbing. Masks are respirators that use military grade filtration technology to filter out nearly 100% of particulate pollution, gases, as well as bacteria and viruses in a fashion friendly mask suitable for the whole family. Facebook fans 4,953. Twitter followers 571. Cambridge, England About Blog Cambridge Mathematics are developing a coherent, transparent, evidence-based vision that will make a major contribution to mathematics education internationally. Follow us to keep up with articles on Cambridge Mathematics. Facebook fans n/a. Twitter followers 6,000. Cambridge, UK About Blog Reach Cambridge has been providing academic residential study programs in the historic city of Cambridge since 2005. Their mission is to prepare their students for university and widen their horizons. Follow us to keep up with learning programs from Reach Cambridge. Facebook fans 5,003. Twitter followers 380. Cambridge, England About Blog The Tamburlaine hotel is a hotel located in Station Road Cambridge. It's a place to stay and a space to gather. It features Guide, tips, things to do, how to spend a weekend in Cambridge, tips on what to see, do, eat & drink and more. Follow us to keep up with articles from Tamburlaine. Facebook fans 990. Twitter followers 1,175. Cambridge About Blog Cambridge International Law Journal is published by Edward Elgar Publishing. It is a double-blind, peer-reviewed journal with a broad focus on international law. The Journal provides a platform for both young and well-established academics to publish outstanding research on cutting edge, highly topical international law issues alongside, and in dialogue, with each other. Facebook fans 704. Twitter followers 185. Cambridge About Blog Follow us to keep up with articles on Parenting from Yana. Cambridge, England About Blog Literature Cambridge is an independent educational organisation providing top quality courses on the best of English literature. Their courses are taught by leading academics and are open to all. Facebook fans 1,063. Twitter followers 2,118. Cambridge, UK About Blog Cambridge University Women's Boat Club is the rowing club for women at the University of Cambridge and race Oxford University in the Boat Race. Their mission is to beat Oxford in the Boat Races. Follow us to keep up with all the latest news from Cambridge University Women's Boat Club. Facebook fans 3,373. Twitter followers 5,077. Cambridge, UK About Blog The Cambridge Museum of Technology shows the progression of power technology through steam, internal combustion, to electricity. The exhibits in the museum include working engines, telephone exchanges, printing presses and many more wonderful and interesting contraptions. Facebook fans 756. Twitter followers 2,028. Cambridge UK About Blog Cambridge Science Centre is an independent education charity offering hands-on exhibition, interactive shows and workshops to inspire and ignite children's curiosity in Science, Technology, Engineering and Maths. Facebook fans 7,810. Twitter followers 5,675. Cambridge, UK About Blog The Museum of Cambridge, a small museum, telling a big story. It was set up in 1936 by leading members of the town and university. Their collections represent Cambridge and Cambridgeshire history and heritage over 300 years, including objects related to everyday life, customs and traditions of local people, places and events. Facebook fans 1,497. Twitter followers 5,094. 30. The Cambridge Wine Blogger | A blog. About wine. Mostly. Cambridge, England About Blog Welcome to the blog of Faculty of Education Research Students’ Association (FERSA) at the University of Cambridge. Our aim is to represent different voices and perspectives on our work and life as educational researchers. Facebook fans 296. Twitter followers 1,213. Cambridge, UK About Blog Welcome to Cambridge Mummy by Liz Weston. She uses her blog as a way of spreading her thoughts of peace and joy to you all. Facebook fans 186. Twitter followers 2,743. Cambridge, England About Blog Mapped Out is a Cambridge based blog covering fashion, beauty and lifestyle. You will find everything from beauty reviews to fashion inspiration, travel recommendations and more. Facebook fans 428. Twitter followers 2,473. Cambridge About Blog The Cambridge Web Marketing Co blog covers news, tips, metrics and other bits and bobs relating to search, blogging and digital marketing. Facebook fans n/a. Twitter followers 1,270. Cambridge, England About Blog The Parker Library includes rare books and manuscripts library of Corpus Christi College. Follow us to keep up with articles from Parker Library. Cambridge, England About Blog Circular Cambridge is a project of Cambridge Carbon Footprint, a small local charity concerned with climate change. Their aim is to help people work together creatively to make real reductions in their CO2 emissions. It celebrates progressive ways to design, manufacture, access and reuse the things we want and need in our lives. Facebook fans 230. Twitter followers 155. 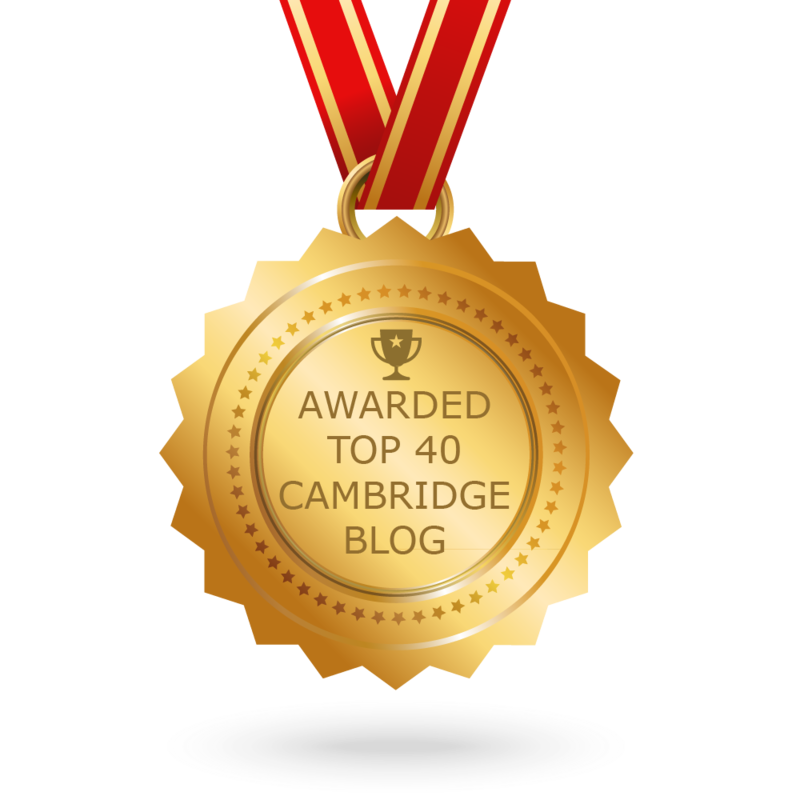 CONGRATULATIONS to every blogger that has made this Top Cambridge Blogs list! This is the most comprehensive list of best Cambridge blogs on the internet and I’m honoured to have you as part of this! I personally give you a high-five and want to thank you for your contribution to this world.